Pasta is no longer off the menu, after a new review of studies suggested that the carbohydrate can form part of a healthy diet, and even help people lose weight. For years, nutritionists have recommended that pasta be kept to a minimum, to cut calories, prevent fat build-up and stop blood sugar spiking. The low-carb food movement spawned such diets as the Atkins, Paleo and Keto, which advised swapping foods like bread, pasta and potatoes for vegetables, fish and meat. More recently the fad of swapping spaghetti for spiralised vegetables has been championed by clean-eating gurus. A new study has found that eating three pasta meals a week can help people lose weight. But now a meta-analysis of 30 studies by Canadian researchers found that not only does pasta not cause weight gain, but three meals a week can help people drop more than half a kilogram over four months. The reviewers found that pasta had been unfairly demonised because it had been lumped in with other, more fat-promoting carbs. “The study found that pasta didn’t contribute to weight gain or increase in body fat,” said lead author Dr John Sievenpiper, a scientist with the St Michael’s Hospital’s Clinical Nutrition and Risk Modification Centre in Toronto. “In weighing the evidence, we can now say with some confidence that pasta does not have an adverse effect on body weight outcomes when it is consumed as part of a healthy dietary pattern. “In fact analysis actually showed a small weight loss. So contrary to concerns, perhaps pasta can be part of a healthy diet. The new review reassessed evidence from 30 randomised controlled trials involving nearly 2,500 people who ate pasta each week, alongside a low glycemic diet – a food plan, which prevents the blood sugar from spiking. Those involved in the clinical trials on average ate 3.3 servings of pasta a week instead of other carbohydrates, one serving equalling around half a cup. They lost around half a kilogram over an average follow-up of 12 weeks. Unlike most refined carbs, pasta has a low glycemic index, meaning it is absorbed into the bloodstream more slowly and so does not cause high blood sugar levels. The authors concluded that pasta could form part of a low-glycemic diet, which is often recommended for people who are trying to lose weight, or who suffer chronic illnesses such as diabetes or cardiovascular disease. Naveed Sattar, Professor of Metabolic Medicine at the University of Glasgow said: “I tend to agree. I eat pasta regularly and if consumed in modest amounts then no reason for it to cause weight gain. “So it’s nice to see this evidence. In the end, weight gain occurs with overconsumption of calories and so portion size matters. The research was published in the journal BMJ Open. Geeta Sidhu-Robb, founder of Nosh Detox, the clean eating home delivery service whose clients include Madonna and Gwyneth Paltrow said: “Simple-carb foods are those that your body breaks down quickly and easily, including sweeteners such as sugar and honey or refined grains like pasta. They walk or run miles every day – often barefoot. They survive on a diet of vegetables, fruit, meat and fish – which they like to eat raw. They sleep on the ground and wear loincloths made of bear skins – OK, I made that last part up. These are the modern-day paleo fanatics and there may be one sitting right next to you. This return to the Stone Age movement involves living like our ancestors did in the Palaeolithic period, the era of human history which started about 2.6 million years ago and ended around 10,000 BC. Back then people worked in small, tribal groups known as “bands”, and led an active, outdoorsy lifestyle. With just simple stone and wood tools, eventually they conquered every continent except Antarctica. They hunted a range of bizarre animals, from tiny hippos to giant sloths, and gathered what they could find. Think of the recent Aardman film Early Man, but with less football. The craze to copy the paleo humans started with the paleo diet, swapping processed and carbohydrate-rich foods for a high-protein, high-fibre menu. Now the Stone Age practice is sneaking into our offices too. Today it extends to all kinds of uncomfortable habits. Diehard enthusiasts across the globe have been taking up barefoot running, swapping mattresses for cold, hard earth, not eating for days at a time, going to the toilet in a squatting position, and even donating blood regularly to simulate being wounded, to name but a few. It seems that long work hours, high stress levels, massive, open plan buildings and sitting at our desks all day aren’t very good for our health – who would have thought it? And all of these things can be bad for productivity, too. Enter the paleo office, a concept which could make our workplaces more efficient. This isn’t about growing your beard out or holding meetings in caves. It’s about small changes that will make the time we spend at work more compatible with human biology. For example, taking walking meetings, investing in standing desks, and taking regular breaks to de-stress. Proponents argue that while technology and culture are evolving at astonishing speed, our bodies are not. They say that humans today are essentially hunter-gatherers, displaced in a world of massive global businesses and long hours. It’s a controversial idea, but regardless of your views, anything that makes office life easier to bear is difficult to argue with. “There’s three aspects to it – one is the organisation of the office and how it’s managed. The other thing is to create an environment which is, at least, approaching something we’re used to as hunter gatherers. And the other thing is to make it less sedentary,” says Gustav Milne, who recently authored a book about how we can improve our lifestyles by better understanding our prehistoric past. Take company size. In the corporate world it’s often assumed that bigger is better, but this may not always be the case. While larger teams may get more done overall, individuals in big groups actually perform worse. Theories abound as to why, ranging from the idea that it’s easier to find the right support in a smaller group, to a tendency to agree with everything your colleagues say if you have too many people in one team. Amazon CEO Jeff Bezos calls it the “two pizza rule”: if a team can’t be fed by two pizzas, it’s too large. But one reason around maximising individual performance at work is rooted in our biology. In fact, maintaining friendships can be very mentally draining and there’s a limit to the number of people we can keep up with socially at any given time: around 150. These are our so-called “casual friends”, the kinds of people we follow on social media and might invite to a large party. This rule has been shown to apply across multiple cultures and eras; from ancient Mesopotamian villages to the nomadic !Kung San people of Botswana, the number of people we know is exactly the same. But fast-forward to today and we’re forced into massive social groups on a regular basis. Apple’s new headquarters in California will eventually house 12,000 employees, while Google’s giant new office in London will be capable of housing 7,000 people. There may be downsides to this. The thing is, the magic number of people we can know – known as Dunbar’s number – is hardwired in our biology. It’s limited by the size of our brains, and first emerged around 250,000 years ago, when we were living in tribal groups. Even today, 150 is the average size of military companies and academic circles. Following this principle, in the future, limiting offices to 150 people might create happier and more productive workplaces. If everyone has met and has some kind of personal relationship, it might be easier to cooperate with colleagues and your boss is unlikely to be intimidating or aggressive. Already, there is some anecdotal evidence that this is the case. As of last year, Gore-Tex, which makes waterproof and breathable fabric, has appeared on Fortune magazine’s ‘100 Best Companies to Work For’ list 20 times. It prides itself on not having a rigid hierarchy; instead it has a “latticework” approach to management, which treats its employees more like a structure of interwoven talents. How has it achieved this harmony? As Malcolm Gladwell explains in his book The Tipping Point, the company adheres to what he called the “rule of 150”. The story goes that in the company’s early days, its co-founder Bill Gore noticed that when a factory reached 150 employees, it started to become less efficient and productive. From then on, he limited all his factories to this number of people; instead of expanding them, he just kept building more new factories next door, creating a community of staff that were willing to work hard and help each other out. Dunbar explains that once organisations expand beyond 200 people, communication really breaks down. Firms begin to need a top-down management structure because face-to-face communication stops and a silo effect can kick in, for instance, when different parts of a company end up working on the same project, but no one notices, duplicating work and wasting resources. This is something Patty McCord, the former chief talent officer at Netflix and the author of Powerful: Building a Culture of Freedom and Responsibility, is familiar with. “Often when I work with start-ups I say that you have to change the way you communicate when you can no longer do it standing up on a chair. And that’s about 150 people if you’ve got a room that’s big enough,” she says. This is partly for entirely practical reasons – “To speak with people you have to go to another country, another building, another floor,” says McCord – but there are other factors. In smaller organisations where everyone has some kind of personal relationship, people are more likely to be helpful and less likely to shirk their obligations. They also tend to have a better understanding of what the business is about, since they’re likely to have bonded with colleagues in several departments beyond their own home team. If the paleo movement is all about moulding our lifestyles and environment to suit our biology, adhering to Dunbar’s number in the office might be a good place to start. It makes sense that organisations based on personal relationships would be more efficient, while navigating politics and collaborating would be a lot easier if you at least knew everyone’s name and role. “The more people understand the [whole] business, the more they understand the customers they’re serving, then they can be much more aligned and make better independent decisions,” McCord explains. But there are other ways of aligning our future workplaces with our paleo past. One is to bring some nature into the office. It’s thought that our prehistoric ancestors spent a large portion of their day outdoors. In contrast, the average American spends 47 hours every week confined in offices. Recently researchers at the London School of Economics estimated that the psychological trauma of this daily slog costs the US economy about $250 billion every year. In 2013, an EU-funded project estimated that work-related depression costs Europe €617 billion annually. One 2014 study found that employees were 15% more productive when their fashionable, minimalist offices were filled in with houseplants. Facebook last year announced plans for a new building in Menlo Park, California, which boasts a garden roof the size of nearly seven American football pitches. The new $5 billion Apple HQ, Apple Park, is even more extravagant, with around nine thousand newly planted trees. But other firms are trying a different tack. “One of the nice things is you get an extra oxytocin bump if you’re having a rough day,” says Phil Nottingham, a strategist who works for the online video hosting company Wistia, based in Cambridge, Massachusetts. He’s talking about petting his co-worker Lenny, a charismatic red labradoodle who has been with the company since the beginning. Lenny has recently been joined by Waffles, a golden retriever, and Tofu, who’s a Shiba Inu. They spend most of the day chewing things and loudly interrupting meetings, but the company welcomes all dogs, so long as they don’t aggravate any allergies or wee on the floor – standards you can’t really argue with. Nottingham believes that the whole company benefits from their presence there. And there’s emerging evidence that colleagues you can cuddle may reap benefits in terms of employee satisfaction, too. There haven’t been many studies on the impact of pets in the workplace, but there is some low-budget research from 2006. It involved showing college students a picture of an office that contained a cat, dog, or no animal, and asking them to rate their satisfaction and mood if it were their office. Those who viewed the pet-containing office said they’d be happier and more sociable, though they also saw their imaginary workplace as less professional, clean and safe. Meanwhile, a study from 2012 found that employees who were allowed to take their dogs to work started the day just as stressed as everyone else – but as the day progressed, they became significantly less so than those who weren’t allowed their pooches. The final flourish in any self-respecting paleo office is to encourage movement at all costs. It’s now well known that a sedentary office life can sap workers of energy and increase their risk of death. Enter so-called “low fat” buildings, which encourage physical activity with sneaky design, such as centrepiece staircases and hiding the lifts. Just a few years ago, standing desks were the preserve of mavericks in Silicon Valley, but today these too are entering the mainstream. In Scandinavia, 90% of office workers have access to one, while in Denmark, it’s a legal requirement for companies to provide them. Walking meetings are also on the rise, with fans such as Facebook’s Mark Zuckerberg and Twitter CEO Jack Dorsey. It might have taken millennia to invent the open-plan office, minimalist décor and desks, but with a bit of luck, we’ll be back to the Stone Ages soon. Just don’t swap your suit for a loincloth just yet. A US-based study has find tiny particles of plastic in most samples of bottled water tested by researchers, but it’s not known whether the so-called microplastics are a health risk. The study, carried out by non-profit journalism group Ord Media, involved tests on more than 250 bottles from 11 top bottled water brands from countries in Asia, Europe, Africa, and the Americas. It found 93 per cent of bottled water sampled had some sign of microplastic contamination. For plastic particles in the 100 micron, or 0.10 millimetre size range, tests at the State University of New York revealed a global average of 10.4 plastic particles per litre. These particles were confirmed as plastic using an industry standard infrared microscope, Orb reported. The tests also showed a much greater number of even smaller particles that researchers said were also likely plastic. The global average for those particles was 314.6 per litre. With the smaller particles there was a possibility some of the particles could be other contaminants as well as plastic, though “rationally expected to be plastic”, Orb reported. Some bottles had thousands, a few “effectively” had no plastic. One bottle had more than 10,000 particles per litre. The scientific report said data suggested contamination was at least partially coming from packaging and/or the bottling process. Bottled water manufacturers had emphasised their products met all government requirements. A 2016 European Food Safety Authority report said as many as 90% of microplastic particles consumed might pass through the gut without any impact. Of the rest, some can lodge in the kidneys and liver. Orb quoted one toxicologist saying knowledge about the toxicity of microplastics was limited. As fas as was known there was little health concern. A World Health Organisation official told BBC News the research had not been done to know what the plastic particles might do in the body. WHO was to launch a review into the potential risks of plastic in drinking water. Gerolsteiner, a German bottler, and Nestle both said their own tests found much lower quantities of microplastics in their water than the amount found in the Orb study. Orb was also behind a study last year that showed tap water around the world is also contaminated with microplastics. That study used different methods to identify microplastic but there was room to compare the results, Orb said. For microplastic debris around 100 microns in size, about the diameter of a human hair, bottled water samples had 4.45 microplastic particles per litre, compared to the 10.4 in the bottled water. Microplastic was also found in water in glass bottle samples. University of East Anglia biochemistry lecturer Andrew Mayes, who developed a technique used in the study to identify the microplastic, told Fortune a batch of glass bottles checked for comparison, also had microplastics. Two of the best-known brands tested in the Orb study were Evian and San Pellegrino. For both brands, there were samples with no microplastics, while for Evian the highest number was 256 particles “rationally expected to be plastic”, while for San Pellegrino the highest number was 74. Danone, which owns the Evian brand, told BBC News it could not comment on the Orb study because “the methodology used is unclear”. It said its bottles had “food grade packaging” and highlighted a smaller 2017 German study that found plastic particles in single-use bottles but not above a statistically significant amount. How much junk food can you ‘get away with’ and still be healthy? If you want to enjoy junk food once in a while, take a look at your overall health habits to see how much of an impact it might have on your body. She knows that my nutrition philosophy is the “80:20 rule”: Eat healthy foods as often as possible (at least 80 percent of the time), but also enjoy the occasional less healthy food (less than 20 percent of the time), if that’s what you really want. I’ve seen this approach work well with my clients who were previously chronic dieters yet hadn’t been able to lose weight. Once I give them permission to have “forbidden foods”, those foods lose their power and they’re able to make healthier choices the bulk of the time. * Is healthy food really more expensive than junk food? A review of studies on fast food and heart health found having fast food more than once a week was linked to a higher risk of obesity while eating fast food more than twice a week was associated with a higher risk of metabolic syndrome, type 2 diabetes and death from coronary heart disease. Another effect of just a couple of days of junk food is poor digestion. Because junk food lacks fibre, eating too much of it could lead to constipation. Just one serving of junk food can increase inflammation throughout your body. Further, an Australian study suggests that in people with asthma, a fast food meal high in saturated fat can increase inflammation in the airway, potentially making an asthma attack more likely. So it seems the quick hit of junk food, while fleetingly rewarding, does carry short-term risks. If you want to enjoy junk food once in a while but are concerned about the impact on your health, take a look at your overall health habits. Do you smoke or overdo it on alcohol? Are you exercising regularly and eating plenty of nutritious foods such as vegetables, fruit, legumes, fish, nuts and seeds, and whole grains? When it comes to your health, it seems you can “get away with” the occasional junk food more easily when you follow a healthy lifestyle most of the time. So think about your ratio of healthy to less healthy foods. Are you achieving 80:20 or is there room for some improvement? When you’re making the choice between a healthier option and junk food, consider that just one healthy meal a day worked into a typical diet could reduce overall stress and inflammation in your body. Every meal is an opportunity to positively impact your health. Based on the current research, my advice to my client essentially remains the same: Once you’re aware of all of the short-term and long-term impacts of junk food and you still really want some, have it less than once a week and really savour it. Then get right back to enjoying nourishing, nutritious foods. Christy Brissette is a dietitian, foodie and president of 80TwentyNutrition.com. Also called walleye pollock, the species Gadus chalcogrammus is usually caught in the Bering Sea and Gulf of Alaska. A low fat content of less than 1%. A wellness blogger has revealed the ingredients health fanatics could never live without if they want to eat clean. 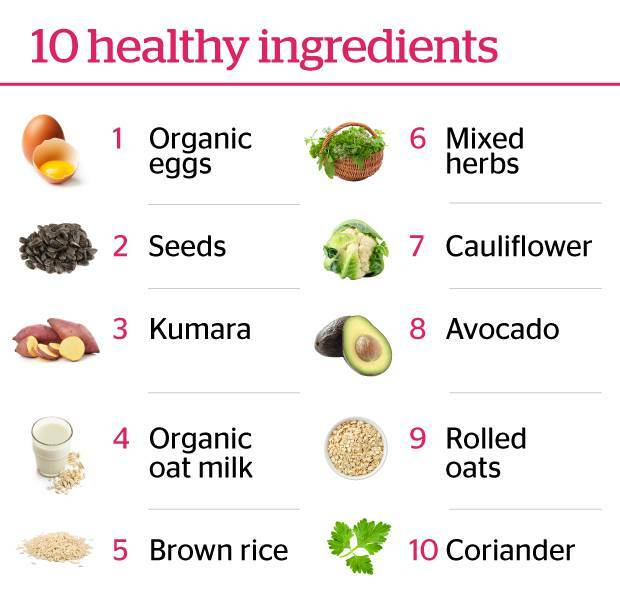 Lily Simpson, who founded healthy food delivery service and deli chain The Detox Kitchen, says there are 10 staples that she always keeps in her cupboards at home, according to The Daily Mail. The co-author of The Detox Kitchen Bible favours organic fare and dairy-free produce for her super-healthy diet – and of course, avocados are on her list too. Lily’s list of top 10 foods, which she shared in a video with Tor Cardona for Sheer Luxe, to keep in stock at all times gives an insight into the virtuous eating habits of influential wellness bloggers – and it could inspire you to throw out the chocolate and replace it with brown rice, seeds and herbs instead. Fried, boiled, poached, or scrambled – but I also love to make a frittata in the evenings, it’s super quick and easy. I love sunflower seeds, and pumpkin seeds. I flash fry them and chuck them into a salad, it literally transforms any salad. I’m often roasting them off, and I love making a sweet potato dhal. I always have oat milk in my fridge. It’s a great alternative to dairy, it’s great in cereal, with tea or with coffee. It’s really great to have as a drink before you go to bed. One of my favourite all-time salads is a brown rice salad with loads of spring onions, nuts, cucumber, and tomatoes. I have brown rice maybe five times a week. 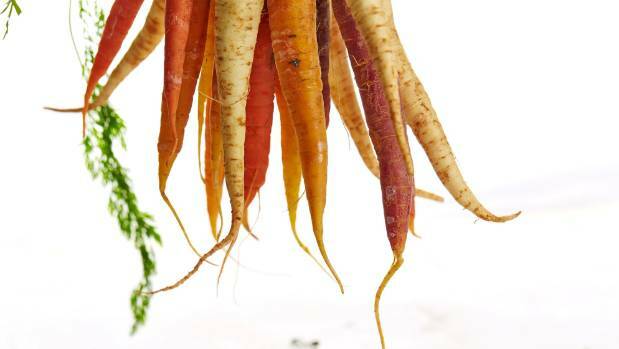 Just throw them into a stew or soup or salad and it will transform the dish and give it an extra boom of flavour. Probably my favourite vegetable. Amazing in soups, stews, curries. Amazing on toast or on a salad or grilled is good too. They are my go-to breakfast. I have it as a porridge or make my own granola by covering them in golden syrup and then roasting it in the oven and then mixing with chopped nuts. It’s my favourite herb. You love it or hate it, I absolutely love it. I throw it into any salad or it’s great just chopped on a curry or in a soup. Veganuary is a thing and this year it has taken off like never before. People in the UK and across the world are trying out veganism for the month of January and it’s likely to have been a tricky task to take on for meat, cheese and chocolate lovers – whether they took on the challenge due to health reasons, ethical concerns or environmental causes. But if you’ve been sticking to your resolutions up until now, you might be disappointed to discover that there are a fair amount of rather surprising non-vegan foods and beverages around to trip you up. Some of these unexpected non-vegan foods may be the deal breaker for those weighing up whether Veganuary should become a long-term lifestyle commitment, or whether it should remain a short-term experiment. Either way, the more you know about what’s vegan and what’s not, the easier it’ll be to avoid temptation or to make informed lifestyle decisions. Too often, though, it seems that animal-derived products are hidden in the small print. Certain beers (particularly British ones) are filtered with isinglass, which is a membrane that comes from tropical fish bladders. The ingredient is used as a fining agent to remove haziness from beers and to make them look clearer, brighter and more appealing to drinkers. But although some beers use isinglass, gelatin, glycerin or casein, German and Belgian beers using traditional methods of brewing, which are vegan – according to German purity law or Reinheitsgebot, which ruled that only the ingredients of water, grain (barley or wheat), hops and yeast could be used. Thankfully, other brewers, both multi-national and micro, are cottoning on to customers feeling sea-sick about the fishy product, and to the fact that they’re thirsty for vegan beer. The Campaign for Real Ale (Camra) has called on brewers to remove isinglass, and Guinness announced in 2016 that its draft stout would be vegan-friendly, and other big brewers including Carlsberg, Stella Artois and Heineken also get the green light for Veganuary after-work pints. Prost! During the wine making process, the wine is filtered through agents which can include blood and marrow, milk protein, and fibres from crustacean shells and gelatin, in order to reduce haziness and cloudiness in the liquid. However, if your day has been really tough, do not fear – there are vegan wines available. Animal-friendly winemakers are turning to activated charcoal and the volcanic clay bentonite to process their products, and these vegan wines are hitting supermarket shelves. This website has a comprehensive list of vegan and non-vegan NZ wines. While Lea & Perrins is often the key ingredient in completing your dish or perfecting your Bloody Mary at the weekend, its worth considering that it is in fact fermented anchovies that give this British brand its famous umami flavour. Luckily, there are other brands to choose from or you could even make your own Worcestershire sauce at home (vegan resource One Green Planet has a recipe available online, as does blogger Martha Stewart). It’s commonly believed that margarine is the vegan alternative to butter. However, the truth is that it often contains traces of whey, gelatin and milk proteins. Checking the ingredients list is one of the only ways to be sure that your margarine isn’t harbouring any milk-derived ingredients. PETA (People for the Ethical Treatment of Animals), have a guide to plant-based, vegan butter and margarine. These floury affairs can be equally as feathery, it turns out. Many breads, bagels and pizzas contain a L-cysteine, an amino acid most commonly derived from human, duck or hog hair. Food manufacturers add this amino acid to bread because it helps speed up large-scale factory production and can improve the texture of commercial bread products, including bagels and doughnuts. Synthetic and microbial versions of L-cysteine do exist and are used in some products, but at present are more costly than hair- or feather-derived L-cysteine. So if you want to avoid human or animal sourced products, it’s worth doing some research. For reference, the E number for L-cysteine is E920. According to The Vegan Society, a number of other food additives can be derived from animal products. Examples include E120, E322, E422, E 471, E542, E631, E901 and E904. Fruit juice might seem like the perfect vegan breakfast drink, but if you’re drinking it from a carton, it could be time to start reading the ingredients more closely. Some fortified juices (those that have added ingredients to up the vitamin count) contain vitamin D3 obtained from lanolin, the waxy substance from sheep’s wool. If your orange juice is promising you a healthy heart, you’re even even bigger trouble, since added omega-3 fatty acids are derived from fish oil and fish gelatin. Anchovies are a common source. To avoid breaking any vegan diets, look for 100 per cent orange juice on the packaging – or start squeezing your own. You should also look for the presence of carmine in pink lemonades and grapefruit juices, which is made from the ground-up shells of cochineal bugs. To avoid a sticky end to Veganuary, figs are worth avoiding. Having laid their eggs inside the fruit, female wasps are often unable to escape and decompose inside. Non-vegans shouldn’t worry too much as the fig plant produces an enzyme that breaks the wasp down into a protein, but technically when you bite into a fig, you’re often munching on the by-product of a wasp carcass. Despite this, you’re unlikely to have ingested too many dead wasps over the years. UK edible figs are normally varieties of the common fig which are still pollinated by wasps but don’t act as a fruity incubator for eggs. And some varieties have even been bred to self-pollinate, removing waspish involvement from the entire process. Artificial sugars seem to go hand in hand with the natural colouring contained in red sweets, which are given their colour by crushed bugs, mainly cochineal insects. Carmine, the red dye often used in confectionery, is made by boiling the crushed bugs with sodium carbonate or ammonia. It’s used as a dye in makeup such as red lipsticks, foundations and eyeshadows, while boiled animal bones provide the fat – or tallow, as it’s more commonly called. Before you tuck into a piece of chewing gum to stifle a hunger pang or resist a chocolate temptation, it’s worth checking the back of the pack, as some gums use bases which are made of gelatin or stearic acid, derived from animals. Marshmallows, gummy bears, and jelly products often use gelatin as a thickener. Gelatin is made from boiling animal products such as leftover skin and bones from meat processing. You can also find it in some pill coatings, jellies, yogurts, and beauty products. For those of you that look forward to the odd one or two sugar cubes in your almond milk tea in the afternoon, it might be best to stick to coconut sugar or maple syrup. White sugar is often bleached after it has been filtered through animal bones. Bone char is made by heating animal bones to incredibly high temperatures and helps removes impurities from sugar. As always, it’s worth checking the label and referring to The Vegan Society’s guide to avoiding non-vegan products. Meanwhile, products such as Silver Spoon royal icing sugar contains dried egg white and therefore would not be suitable for vegans, although it doesn’t use the bone char process. Stress is born, lives, and dies between your ears. Well that’s mostly true. There are certain stressors like financial, physiological and environmental that maybe beyond our control. However most emotional stress is self-inflicted and a product of our thoughts, expectations and beliefs. For the past 15 years I have been studying stress and how to manage it especially in a working environment. Its important to have tools to control your stress levels, rather than your emotions controlling you. Language is the tool that we programme our brain with. It is the tool we teach our children with and manage our work environment. Despite major technological advances the human brain has not changed much in the past few thousand years. What was true of the stoic philosophers Marcus Aurelius and Epictetus is true now. Life is not stressful, its just our view of it that is. Thoughts are our internal language and programming code for the brain. Certain words are more stressful than others. We think in patterns and attitudes that generate cortisol, put our blood pressure up, make us age prematurely and we can transfer these attitudes to those around us and the generations that follow. Having studied thousands of people’s thoughts I noticed common attitude profiles and gave them a diagnosis and cure. I covered these in my book the Power of Healthy Thinking but words are powerful and potentially damaging. Words like “should” and “must” are demanding and stressful. “You should tidy your room” can be replaced with “I would prefer you tidied your room otherwise here are the consequences”. Without appropriate consequences we don’t tend to change our behaviour. “I must get everything done for everybody” can be replaced with “I would rather get everything done but in fact I need some time for myself or my family”. We are often too hard on ourselves and others. Other stressful and potentially damaging words are “hopeless” and “useless”. No worker, client, parent or child is hopeless or useless, in my view. This profile is the judge and we are quick to judge ourselves and others. If we make a mistake we can blame the situation but if others make mistakes we can blame their character. If someone cuts you off in the traffic there are range of expletives one can use, often in the presence of others. If you cut someone off you tend to blame something or someone else. Stress causes parts of the brain to shut down, thereby increasing your risk of an accident. Most stress is just not worth it. Unless it changes your behaviour, it is what I call an unhealthy emotion. If financial stress causes you to spend less or earn more, it’s a healthy emotion. If you don’t change your behaviour then you are just wasting your time getting stressed and often winding up others at the same time. I use what I call cognitive switches to manage stress. When things go wrong as they often do, I tell myself, “there are no problems only solutions”. My mind shifts to a different part of my brain and I looking for solutions, rather than dwelling on the problem. 2018 will have its challenges as well as its rewards. Remember it’s not what happens to you that is important, its how you deal with it that counts. If you want to know more check out our website healthythinking.biz. 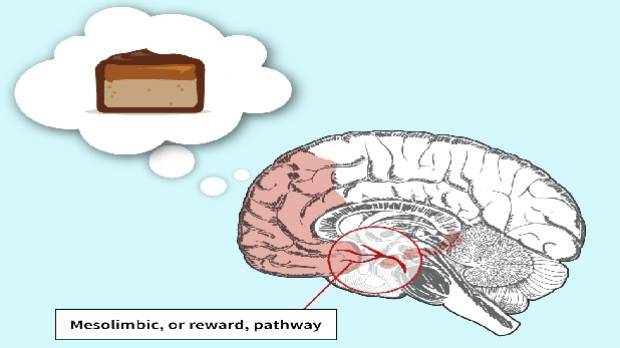 The part of the brain that senses hunger is also integrated into the rewards system. To tell the story of what sugar does to your brain, you have to start with the thought that triggers your need for a hit of sweetness. It often happens in the afternoon when your brain, which runs on sugar, starts to get hungry. To satiate the craving your brain activates a string of neurons, often referred to as the reward pathway, which pump the chemical dopamine into your brain. 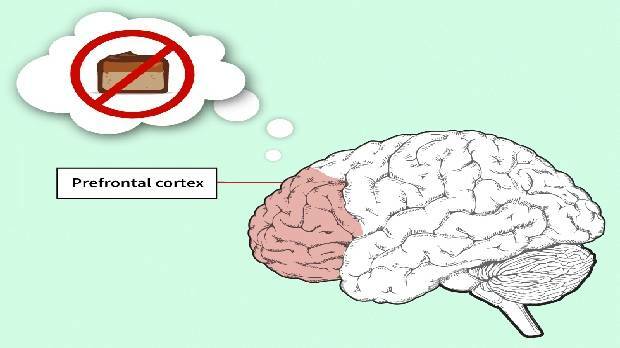 The prefrontal cortex acts as the brain’s “brakes” but it’s weakened by too much sugar (and fat). All of a sudden you need a chocolate bar or that sweet pastry you saw at lunchtime. 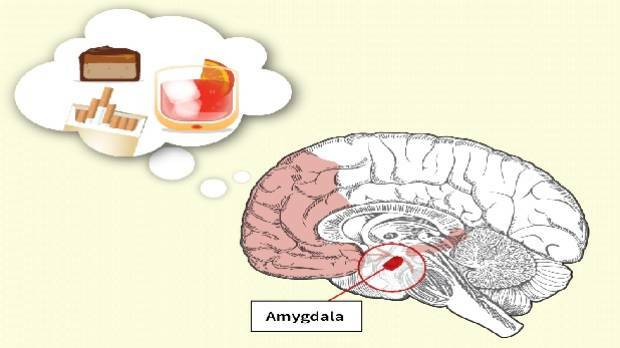 Nicotine, alcohol, sugar – the desire for them is also linked to the part of the brain that registers fear and stress. If you act on that craving, the reward pathway then switches mode, pumping chemicals such as beta-endorphins into your brain, generating feelings of pleasure. Your brain thanks you for the sugar hit by making the chocolate bar literally taste sweeter, says Dr Zane Andrews, a scientist at Monash University who studies how our brains regulate control of our diets. But if you respond to the brain’s need for sugar too often, the reward pathway can develop tolerance to the stimulus. In animals, and men and women, a high-sugar diet seems to impair the hippocampus, which controls memory. “That means we need to eat more to get the same feeling. That’s a classic feature of addiction,” Andrews says. You do possess the ability to resist cravings – it’s called willpower. 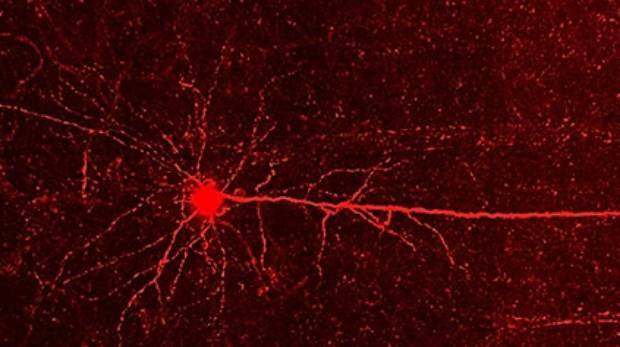 That ability to stop yourself comes in part from a network of neurons called inhibitory neural circuits. These circuits occur throughout your brain, but are particularly concentrated in the parts involved in decision-making, impulse control and delaying gratification. “They are kind of like the brain’s brakes,” explains RMIT sugar scientist Dr Amy Reichelt. But if you find you can’t resist that craving for a chocolate bar don’t be ashamed – you may be able to blame it on the sugar. In world-first research using rats, Reichelt has shown that high-sugar diets can alter decision-making and the ability to control behaviour. Her studies revealed that rats fed on high-sugar diets suffered a loss of those willpower neurons. Much of the research, though, on sugar’s impact on the brain has yet to be replicated in people. In another study conducted last year, a team led by Professor Richard Stevenson from Macquarie University asked a group of volunteers to rate how much they wanted to eat several snack foods when they were feeling hungry versus when they were sated. They found that the volunteers who regularly ate a high-fat, high-sugar diet were much more likely to crave snack foods even when they weren’t hungry. A pyramidal neuron in the brain of a rat fed a normal diet. The scientists suggest the high-sugar and fat diet was actually impairing the ability of the brain to block food cravings. CAN YOU GET HOOKED ON SUGAR? Let’s say you manage to use your willpower to get on top of your craving for that chocolate bar. But the feeling does not go away. Your mouth runs dry. You can taste the first bite. Your work performance drops. It’s just like … (you think wistfully to yourself) … craving a cigarette. Maybe the similarities run deeper than that. In world-first research, Queensland University of Technology neuroscientist Professor Selena Bartlett claims to have found evidence that high-sugar diets act on the brain in very similar ways to tobacco, alcohol or other physically addictive substances. 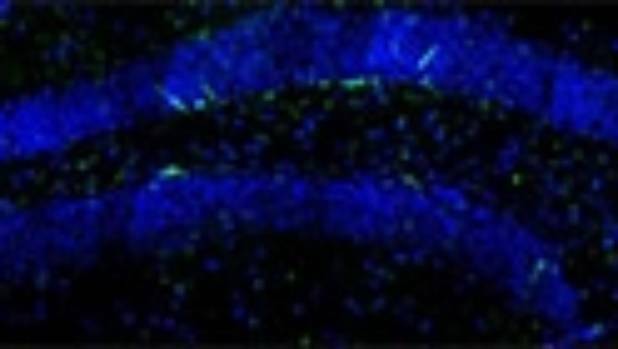 The green flecks are new immature neurons in the hippocampus of a mouse but their number has been reduced by chronic sugar consumption. Her work targets the basolateral amygdala, a small region in the brain that is linked to fear and stress, and the prefrontal cortex, which sits at the front of the brain. She found that mice who had binged on sugar had far fewer links between the neurons in these regions and looked a lot like animals addicted to alcohol. More remarkably, when her researchers gave mice a medication used to treat nicotine addiction, they stopped eating as much sugar. 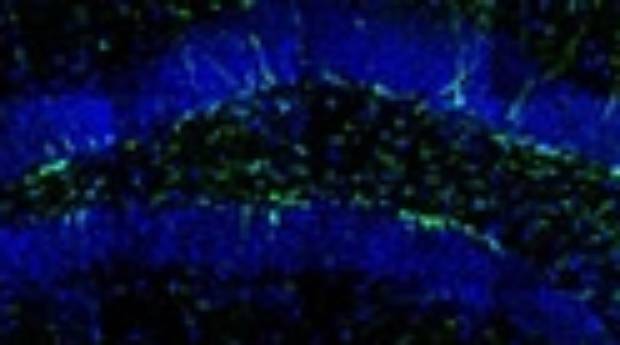 The amount of newborn neurons (green) is much higher in the brain of a mouse fed a normal diet. “What we discovered in the last five years is that sugar is as addictive as alcohol. We nailed a very specific set of circuits in the brain that alcohol and nicotine bind to,” Professor Bartlett says. In a hotly contested field, claims about sugar’s addictive qualities are among the most fraught. “When we look at obesity, we’re not finding those addictive qualities at all. Where’s the evidence for that?,” says Professor John Dixon, a researcher with the Baker Heart and Diabetes Institute. Even University of NSW Professor Margaret Morris, one of the leading proponents of the theory that sugar can damage the brain, says the evidence for actual addiction is weak. “We did a review of the evidence and we had to conclude, on the balance of evidence, that there was no strong evidence for sugar addiction in humans. Most research on sugar’s impact focuses on a small horseshoe-shaped region in the middle of the brain, about level with your ear, called the hippocampus. It is responsible for memory formation and navigation; to do that, it needs to be continually building new neurons or rewiring existing pathways. This role makes it vulnerable to external stresses – potentially such as diets high in sugar. In animals, the research is fairly clear: sugar damages their ability to make new memories. The first person to confirm that effect in humans was Professor Richard Stevenson, leading a team at Macquarie University, earlier this year. He had volunteers spend a week eating a high-fat, high-sugar breakfast. After just four days, their performance on memory tests fell dramatically. “Sugar seems to adversely impact the hippocampus and longer-term brain structures that are involved in decision-making and pleasure,” he says. The University of Sydney’s Dr Kieron Rooney once did a quick study – largely for a lark – on a small group of people who signed up to a popular quit sugar diet. He was surprised to find that their memories had significantly improved by the end of the diet. Morris has spent more than 20 years putting rats on high-sugar diets. She says the results are consistent and repeatable. “Weight gain and a cognitive decline – it’s quite a large effect,” she says. Obesity is characterised by low-grade inflammation throughout the body. The theory, Morris says, is that with excess sugar and fat in the diet inflammation also appears to affect the hippocampus, impairing its function. 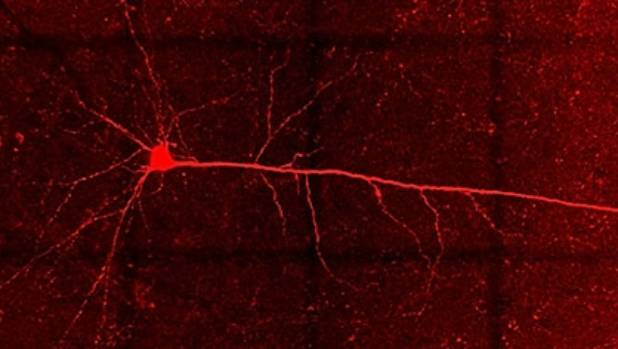 High-sugar diets also reduce the levels of a chemical needed for new neuron formation – which is crucially important to the hippocampus’s job of creating new memories. 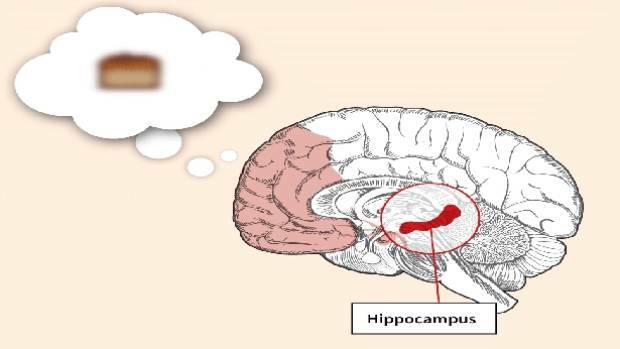 The most prominent and studied impact of sugar on the hippocampus is navigation. We use the hippocampus to build an internal map of our surroundings. Morris found that navigation for rats fed a high-sugar diet is significantly impaired. She also makes it clear though that her research on sugar’s effects on the brain has not been replicated in people, so the link to how humans will react is not definite. “It’s probable but it’s far from confirmed,” Morris sums up. So, what can you do to protect your brain from sugar? Beyond trying to eat less of it, not much, experts say. To deal with the addictive powers of sugar, Bartlett suggests meditation exercises to build focus and willpower. Omega-3s, the fats contained in fish oil, have shown potential neuro-protective effects in some trials, plus the ability to bolster hippocampal function. Morris suggests using them to supplement your diet. But ultimately, Morris says, the only magic pill is exercise and following the Australian Dietary Guidelines, which recommend limiting your intake of added sugars. The festive season is a fine excuse or motivation to dust off the cocktail shaker and whip up something fancy, all the better if you can draw upon the provender of your garden for inspiration and substance. Depending on what you grow, you’ll likely have plenty of mouth-watering options – fresh strawberries, raspberries, early stone fruit, including peaches and Japanese plums, and citrus of at least a few lingering kinds. The summer herb garden has much to offer the bartender too – mints of various kinds, lemongrass, verbena, balm and myrtle, stevia, kaffir lime, sorrel, rhubarb, lavender and even acrid, invigorating wormwood. A range of summer drinks can be made with homegrown ingredients. The only real limit is your own good taste. So what should you go if you want tasty summer cocktails and mocktails? If you have a loquat tree, you can try making your own DIY amaretto. This almond-flavoured liqueur is traditionally made from bitter almonds, which are not grown or sold here due to their moderate degree of toxicity. You can make a much safer, but still very almondy version, from sun-dried and cracked loquat kernels. Soak 1 cup of kernels in a litre of vodka for about six months. Sweeten to taste with sugar syrup and use in place of amaretto. Blend it with almond milk, white grapes and ice for an almost-nutritious heat buster. Got a peach tree? Why not make homegrown bellinis. One of the simplest of all cocktails, it relies absolutely on perfect peaches and just enough cold, sparkling wine, simply stirred together and served. Squeeze ripe peaches to a pulp by hand. Force through a sieve, chill and mix 1:2 with dry, sparkling white wine. For something cutely kiwi, use ‘Blackboy’ peaches instead, blended with sparkling rosé. The garden can offer a bounty when it comes to making cocktails. You can use your berries to make a fizzing pink berry spritzer too. In a blender, blitz frozen or fresh berries of your choice, with sugar syrup (1:1 ratio of sugar and water) and ½ cup freshly squeezed lemon juice. Press the mixture through a sieve and discard the solids. Pour into a jug and top with sparkling wine, lemonade or soda water. Pour over ice into glasses with added berries and herbs. Fancy something non-alcoholic? To make the best lemon cordial ever, add the finely grated zest and juice of 5 lemons, along with a pinch of salt, to a litre of strong sugar syrup (2:1 with water). Bring to the boil for 3 minutes. Cover and set aside for 12 hours or overnight. Re-boil, strain and bottle. Dilute roughly 1:10 with chilled water – preferably sparkling. Last year was all about plant protein, sprouted foods and healthy fats. My prediction is that 2018 will be focused on eating to prevent and manage health conditions such as Alzheimer’s disease and boosting digestive health. This year’s Food & Nutrition Conference & Expo was held in Chicago and brought more than 13,000 nutrition professionals together to learn about food and nutrition research and innovation. Here are the top food and nutrition trends you’ll see in the year ahead. Ancient Romans used chicory root to help cleanse the blood and Egyptians used it to purify the liver. It’s popular today as a caffeine free replacement for coffee. Healthy fats are in, and in 2018 we’ll home in on omega-9s (also known as monounsaturated fats) for their potential to regulate blood sugar levels and promote a healthy weight. Algae has been touted as a superfood in its own right, but the newest use for algae is in the production of omega-9 cooking oil. The process doesn’t use genetically modified organisms or chemical extraction, further broadening its appeal. Thrive algae oil is high in heart-healthy monounsaturated fats and low in saturated fats. It has a high smoke point of 485 degrees, which means you can use it in baking, roasting and sauteing. So what does algae oil taste like? It’s completely neutral and odorless, so you can use it in any recipes where you want healthy fat without changing the flavor of the food. Probiotics have been a hot topic in the nutrition world for several years. They’re bacteria that provide health benefits such as better digestion and a stronger immune system. With plant-based eating becoming increasingly popular, people are looking for probiotic sources beyond yogurt and kefir. GoodBelly dairy-free probiotics come in tasty shots, juice, infused drinks and bars so you can get your daily dose of good bacteria any way you like. All GoodBelly offerings feature bacteria strain Lp299v, which has been scientifically proved to survive stomach acid and arrive safely in the intestines, where it can colonize in the gut. In other words, these probiotics go beyond “live and active cultures” – they survive and thrive to give you health benefits. It’s fantastic to introduce healthy bacteria into your digestive tract, but you also need to provide the right fuel to help those good bacteria thrive. That’s where prebiotics come in. Chicory root fibers (inulin and oligofructose) are the only scientifically proven plant-based prebiotics with proven health benefits such as weight management, improved calcium absorption and digestive health. Expect to find chicory root fiber in a variety of foods, including nutrition bars (ThinkThin), yogurt (Oikos Triple Zero), smoothies and oatmeal. You can also find it as a powder (Prebiotin) that can be added to your food and beverages. Alzheimer’s disease is now being referred to as “Type 3 diabetes” and “brain diabetes,” as both conditions involve insulin resistance and deficiency. In 2018, we’ll be focusing more on the importance of eating for brain health. A randomized control trial of the MIND (Mediterranean-DASH intervention for neurodegenerative delay) diet is looking into the benefits of a nutrient-rich diet emphasizing foods such as green leafy vegetables, nuts and berries in preventing Alzheimer’s disease. Frozen blueberries are being given to participants because they are rich in antioxidants that may be beneficial for the brain, particularly when it comes to memory loss in aging. Recent research published in the European Journal of Nutrition found that daily consumption of the equivalent of one cup of fresh blueberries, given as 24 grams of freeze-dried blueberry powder, showed positive changes in cognitive function in older adults over a placebo. Expect to see blueberry powder as a supplement and blueberries being used to create condiments and sauces in savory as well as sweet dishes. Getting healthy whole grains on the table has always been a challenge because of longer cooking times. That’s why food companies are coming up with ways to bring us whole grains and pseudograins (seeds that are served as grains) much more quickly. Fast and portable amaranth, buckwheat and quinoa in single portions such as Ellyndale Q Cups in low-sodium flavors like Savory Garlic & Mushroom. They’re ready in five minutes; just add boiling water and steep and you’re ready to eat. Stevia continues to rule as the sweetener of choice for people wanting to cut down on sugar or calories. As the demand for stevia grows, so do the product offerings. Look for stevia as an ingredient in more beverages, baking mixes and condiments as consumers look for calorie- and sugar-reduced versions of their favorites. Stevia will be mixed with brown sugar, cane sugar and honey by companies such as Truvia to make lower-sugar and lower-calorie options. Because these stevia products are naturally sweeter than sugar, you need to use only half the amount. Cottage cheese used to be only for dieters because it was seen as plain and, let’s face it, lumpy. Now it’s becoming more popular because we’re all obsessed with finding more ways to pack protein into our meals and snacks. This cousin to Greek yogurt is slightly higher in protein and is mostly casein, a protein that can help you feel full longer. Brands such as Muuna make cottage cheese with a texture that melts in your mouth and is sweetened with real fruit and no artificial flavors. Plus it’s low in sugar, with only four grams in the plain version. The keto diet burns 10 times more fat than a standard American diet – even without exercise, research suggests. Researchers studied people who have or type 2 diabetes or were at risk of developing it. They found that those following the low-carb plan advocated by the diet saw the most health benefits compared to those on a typical diet, whether the latter carried out physical activity or not, reports the Daily Mail. Fans of the diet – said to put the body into an ‘optimal’ fat burning state – include celebrities such as Kim Kardashian and Rihanna. Those following it saw significantly better results in terms of their weight, body fat percentage, body mass index (BMI), blood sugar levels and ketones which break down fat. Additionally, their resting metabolic rate – the rate at which your body burns energy when it is at complete rest – was more than ten times than those who ate a standard diet. Researchers from Bethel University in Minnesota studied 30 women and men between the ages of 18 and 65. All had previously been diagnosed with metabolic syndrome, pre-diabetes, or type 2 diabetes. Metabolic syndrome is the medical term for a cluster of conditions – increased blood pressure, high blood sugar, excess body fat around the waist, and abnormal cholesterol levels – that occur together, increasing your risk the heart disease, stroke and diabetes. Their BMI was greater than or equal to 25 (or waist circumference above 37 for men and 31.5 for women) and body fat percentage above 30 per cent. They were randomly placed into three groups, in the order they signed up for the study. For ten weeks the first group consumed a diet of less than 30 grams of carbohydrates per day and did not exercise. The second ate their normal diet and also did not exercise. The third ate their normal diet but exercised for three to five days per week for 30 minutes a session. After ten weeks, the results showed that while ample evidence indicates that exercise is beneficial, the health benefits produced were not as strong as following a ketogenic diet. The findings were published in the journal Diabetes and Metabolic Syndrome. WHAT IS THE KETOGENIC DIET AND HOW DOES IT BURN FAT? A ketogenic diet is a low-carb diet, where the body produces ketones in the liver to be used as energy. It’s also known as a low-carb high-fat (LCHF) plan and the most famous include Paleo and Atkins. Meat, fish, poultry and eggs are all allowed, as are non-starchy vegetables and leafy greens. Dairy, organic, full-fat is recommended for keto diets. It involves limiting added sugars and white, refined carbs and only a small amount of fruit is allowed. Eating high carbs causes your body to produce glucose and insulin. Glucose is the easiest for your body to convert and use as energy so that it will be chosen over any other energy source, it is believed. Insulin is produced to process the glucose in your bloodstream by taking it around the body. Since the glucose is being used as a primary energy, your fats are not needed and are therefore stored. By lowering carb intake, the body is induced into a state known as ketosis, a natural process that helps us survive when food intake is low. This makes us produce ketones, which are produced from the breakdown of fats in the liver. The goal of the keto diet is to force your body into this metabolic state – essentially it’s a type of starvation but not of calories but carbohydrates. However, some experts say low-carb diets bring heart and cancer risks from eating too much fat and protein. Sugar and fructose feed the pleasure center of the brain. We feel good when we eat some sugar. Is a little bit okay? Sure. But how many people stop at just a little bit? A huge proportion of processed foods contain sugar and its substitutes such as high fructose corn syrup. We consume far more sugar now than we ever have, and it’s taking a toll on our health. This report from 60 Minutes talks about the consequences of our society’s addiction to sugar, and how the researchers are responding to their own findings. How much protein is ‘right’ for you? If there’s one claim that’s almost certain to boost sales of a food these days, it’s to say the item is high in protein. Consumers cannot seem to get enough protein – they often turn to it because they’ve shunned carbohydrates, and also associate it with increased muscle mass. While many nutritionists say eating extra is usually harmless – if it’s part of a balanced diet and doesn’t all come from animal sources – and small increases can indeed help with weight control by increasing satiety, others are not convinced, citing the lack of long-term research on high-protein diets. They’re especially uncertain about how the body reacts to or uses processed protein isolates and powders, which have skyrocketed in popularity. A growing body of evidence suggests that some segments of the population should be cautious about hopping on the high-protein bandwagon, infants and young children in particular. Some studies have linked high protein intake in early childhood to a risk of obesity later in life. Researchers are still trying to understand what accounts for that link. Pregnant women, meanwhile, are commonly advised to boost protein intake. But in a recent study of a group of women who consumed relatively high amounts of protein, children born to the mothers who consumed the most during pregnancy were shorter at birth and through mid-childhood than children of mothers who consumed the least protein. Walter Willett, a professor of epidemiology and nutrition at the Harvard T.H. Chan School of Public Health, extends that caution to people of all ages, citing protein’s role in cell multiplication. He explains that protein – especially from animal sources, and in particular from dairy – boosts a growth-promoting hormone that makes cells multiply faster, which is vital early in life but not necessarily later on in life. One preliminary study, which evaluated the self-reported diets of more than 100,000 women between ages 50 to 79, appeared to find a significantly higher rate of heart failure among those who ate a lot of animal protein than among those who ate less of it. Older adults are often told to seek out extra protein, largely to help them maintain muscle mass, which deteriorates as one ages. Willett said that’s not bad advice, but not to go overboard. “Having some hormonal boost from protein sources may not be a bad thing. It may be good – although the most important way to maintain muscle mass is resistance training,” he said. Most nutrition experts are reluctant to cite a single number because individual needs are so variable, but Willett offers some guidance – along with a few qualifications. “I think a range for total protein between about 12 to 20 percent of calories is okay; pushing higher, especially with protein supplements, is certainly not necessary and has potential long-term hazards,” he said. “I am particularly concerned about adding protein supplements, such as whey protein, which has a strong effect on cell multiplication,” he said, then added some practical advice: If protein is taking the place of foods high in sugar or refined starch – white bread, for example – it will benefit the body. But if it’s replacing foods rich in whole grains and healthy fats, it won’t. John Swartzberg, a professor emeritus at the University of California at Berkeley School of Public Health, said certain groups definitely should ignore the increase-your-protein message. It has long been known that too much protein is harmful for people with chronic kidney disease. (Kidneys are responsible for eliminating the products of protein metabolism, and those products accumulate in the blood when kidneys don’t function well.) But it can also exacerbate damage to kidneys that someone may not yet know are already impaired, before clear evidence of poor kidney function is apparent. Swartzberg said some studies show that about 1 in 9 Americans have impaired kidney function, many of them unaware of it. For such people, following the high-protein trend will accelerate a decline in kidney health. “It’s an asymptomatic problem until it’s mid-stage kidney disease,” he said. People who want to assess their kidney status, he advises, can request a blood test for creatinine for initial screening. Even for those with healthy kidneys, Swartzberg urges caution about excess protein. While some nutrition experts say there’s no evidence suggesting eating even twice the recommended daily allowance for protein, Swartzburg says there isn’t enough long-term data to conclude that such a high number is either good for you or safe. He suggests an amount somewhere between 100 and 150 percent of the recommended daily allowance, which is 0.8 grams per kilogram of body weight; that translates to between about 54 grams and 82 grams of protein for an adult who weighs 150 pounds. “I certainly would not eat excessive protein. I would never take any protein supplements. And I wouldn’t advise my children to, either,” he says. Some people think the benefits of extra protein give them a free pass to simply eat more – but protein calories are still calories. Antioxidants called anthocyanins have hit headlines and are linked to a range of health benefits. We reveal what they are and which foods contain them. At BBC Good Food we believe eating a balanced and varied diet, including at least five portions of fruit and vegetables per day, is best for health. But what’s so special about purple foods in particular? All brightly coloured fruit and vegetables contain antioxidants – compounds which play a key role in protecting our bodies – but many naturally purple-coloured foods contain a certain antioxidant called anthocyanin. These are beneficial plant pigments which give fruit and veg their deep red, purple or blue hues. While studies are ongoing, it’s too early to say conclusively whether anthocyanins deserve the recent media headlines that label purple foods as ‘superfoods’. Previous research has linked anthocyanins to a wide variety of health claims, including increased longevity, cardiovascular health, cancer prevention and dementia. Anthocyanins are found in high concentrations in blackcurrants, blackberries and blueberries, as well as in aubergine (in the skin), red cabbage, cranberries and cherries. Blueberries are also high in vitamin C, which helps protect cells and aids the absorption of iron, and contain soluble fibre, which is beneficial to the digestive system. Read more about the health benefits of blueberries. A study in the European Journal of Nutrition found that a supplement containing dried blueberry powder improved brain power in children aged 7 to 10. Research from Tufts University suggests that consuming a blueberry supplement may be effective in improving or delaying short-term memory loss in rats. However, the NHS points out that the existing studies into how blueberries might prevent cancer or improve memory have so far relied on small sample groups or animals, and it is not yet clear whether these findings will translate to larger groups of the human population. Read more from the NHS about the nutritional benefits of blueberries. Pomegranate is a good source of fibre, and also provides vitamins A, C and E, iron, and other antioxidants such as tannins. A further study found that a daily glass of pomegranate juice improved blood flow to the heart, resulting in a lower risk of heart attack. However, the NHS points out that as it was a very limited trial these positive results could have been down to chance. Purple sweet potatoes have recently been in the media spotlight. They are commonly eaten on the Japanese island of Okinawa, which is home to an exceptionally healthy elderly population – with a large number over the age of 100, and rates of dementia reported to be up to 50% lower than in the West. Some scientists think that the large quantities of purple sweet potato in their diet plays a key role in keeping their bodies and brains healthy well into old age. However, to date, there are not many studies into the health benefits of the purple sweet potato, and it’s impossible to say that the Okinawan’s longevity is down to this one food alone. So should we be eating more purple foods? There’s no doubt that naturally purple-coloured fruit and vegetables are an excellent addition to a varied diet, but it’s also important to remember that balance is key and include a rainbow of different colours of fruits and vegetables for optimum health benefits. OPINION: I think we’ve all experienced this: Sitting at a restaurant with a group of friends, everyone orders, meals arrive, but there’s a problem. One of your friends has innocently ordered the chicken, only to find it’s not gluten-free when landing in front of them. To the embarrassment of the table the meal gets returned. So, what’s the deal with gluten and why all the fuss? Gluten is a complex protein found in wheat, barley and rye and testing shows that up to 70 per cent of people have an immune reaction to it. One study showed that gluten increased inflammation in everybody that ate it. When I say ‘inflammation’ think aches and pains. For many people reducing gluten in their diet and going gluten- free helps hugely to reduce this. An example of this is my neighbour, a salt of the earth hunting/ fishing/ welding machine in his forties – the trouble is he’s worn out his knees and needs to take daily medication for pain control. Three months later on a gluten-free diet, gone are the pies and beers associated with his lifestyle – and gone is his knee pain. Another side effect of the new diet? He’s lost 17kg and is feeling years younger. In fact, being gluten-free is now becoming so commonplace that some might say the end of the croissant nigh. Well, yes, we have been eating these foods for thousands of years, but the modern-day wheat most of us eat now is different. Why is this? It can be traced back to Norman Borlaug, an incredible biologist and humanitarian who led the hybridisation of wheat to give us the high yielding, highly disease-resistant, dwarf varieties of wheat we now have. Unfortunately, unknowingly to Borlaug, in making disease-resistant wheat the lectin levels in each grain were concentrated 10 to 100-fold, depending on the variety of wheat. Lectins are a molecule that plants make to protect themselves from the environment. These lectins have now been implicated in causing serious damage to our gut, which leads to gluten intolerance and the resulting immune reactions and inflammation associated with its consumption. The bottom line is that the bread we are eating today is nothing like the bread your grandmother ate. Not only is the bread different to grandma’s, but just about every aspect of the food we now eat is different. We are consuming more simple sugars than any other time in history. These simple sugars feed unfriendly strains of bacteria and yeasts in the gut that throw out the delicate balance of our gut biome, where beneficial bacteria help control our immune responses to food. We are also exposed to more environmental chemicals than ever, which alter our gut biome and negatively impact our immune responses. On top of this, we are eating foods that are nutrient deficient due to the proliferation of processed foods and depleted nutrients in our soils, resulting in key nutrient deficiencies that control our immune system, notably zinc, vitamin A and D.
OK, I hear you now saying, “Ben, this doesn’t make sense… What about the French paradox?”. I hear you. The French paradox talks to the fact that the French eat a lot of bread. Baguettes, croissants and pastries are the norm, yet they have very good health outcomes for a Western world. There are a lot of factors that contribute to the French paradox, but it’s interesting to note that the French have generally not adopted the new modified varieties of wheat. French bakers are still using the traditional Duram type varieties. This is why when you buy proper French bread it goes off (and rock hard) by the afternoon. These traditional varieties also have much lower lectin and gluten levels than modern wheat, resulting in a lower immune response to the food. Voila. So, the next time you’re in France by all means grab a croissant. But until then, if you have any health concerns at all, I recommend you go gluten-free. And if there’s nothing wrong with you, well then I don’t mind you having just a little bit. Ben Warren is a clinical nutritionist and holistic health expert. He is currently completing his phD in nutrition and mental health. How do fizzy drinks affect your health? Fizzy drinks have been making headlines recently, linked with rising tooth decay, obesity and even being blamed for early onset puberty in girls. So, what impact is too much free sugar having on our bodies? What happens to your body when you drink a fizzy drink? When we eat or drink free sugars there is an initial surge of energy in our body and a hormone called insulin is secreted to control this sudden supply. This burst of energy is very short lived and is followed by a rapid drop in energy levels. This peak and trough pattern can affect hunger and is believed by some to affect behaviour and concentration. This is often seen in the classroom mid-morning if children have had a high sugar breakfast as their energy levels plummet at this time. It is well documented that sugar is strongly linked to dental issues – a third of five-year-olds and almost half of eight-year-olds have some decay in their milk teeth. There is also emerging evidence that a high sugar intake may be linked to early puberty in girls resulting in an increased risk of breast cancer. Further studies into this area are required however, before a strong association is made. How much sugar should my child have? Some health experts believe that sugar intake is driving obesity levels in children and fizzy drinks are a major contributor to this. There are up to nine teaspoons of sugar in a can of fizzy drink, which equates to 36g sugar – exceeding the daily recommendation for children. The latest figures show that on average sugar makes up 13% of children’s (15% of teenagers) daily calorie intake, which is well above the recommended 5%. This is the driving force behind the introduction of the Sugar Tax, due to be implemented from April 2018. In essence, this is a levy on soft drink companies who will be required to pay a charge for drinks containing added sugar of more than 5%. As healthcare professionals, solely linking sugar to the rise in obesity levels is a bold move, as the causes are multifactorial. There are three other significant influencers for the recent rise in obesity; the lower overall nutritional quality of diets, increased average calorie intake and decreased levels of physical activity. It is important not to forget these factors when talking about the health of our children. Dilute a small amount of fruit juice with sparkling water, rather than giving fizzy drinks. Cook from scratch as often as you can. Batch-cooking and freezing at the weekend often helps. Choose porridge, granary breads or eggs in the morning, instead of high sugar cereals. Use the half and half approach – add a low sugar or wholegrain cereal to a higher sugar option as this will make it easier to reduce your child’s reliance on sugar in the morning. As their taste buds adjust, gradually use less and less of the sweetened varieties. Encourage positive associations with fruits and vegetables by playing up their good qualities. Use sliced banana, cheese or avocado on toast rather than honey, jam or marmalade. Quick, what do potatoes, paprika, and eggplant all have in common? If you said “delicious,” you aren’t far off, but there’s a more important similarity as well: these three plants (as well as tomatoes and all varieties of peppers) belong to the nightshade family. While the vast majority of people have no problems with nightshades, they can cause serious problems for anyone struggling with an autoimmune disease, as well as some people who simply have a digestive sensitivity to them. Members of the family Solanaceae, common nightshades include white (but not sweet) potatoes, eggplant, tomatoes, and peppers, both the eye-watering chilies and the sweeter bell peppers. The list of edible nightshade plants also includes any spices made from peppers, like paprika, red pepper flakes, and cayenne pepper (although black pepper is a different plant). The list of edible nightshades is fairly short, but the list of poisonous ones is quite extensive. Most nightshades are toxic to humans, with the best-known being belladonna, or “deadly nightshade,” traditionally valued for its use as a poison (in the play Macbeth, for example, belladonna poisoning features as a plot point). The association with such toxic family members makes some people very concerned about all nightshades – they worry that if deadly nightshade is such a terrifying poison, then even the apparently harmless tomato must be up to no good. Farmers and gardeners in some traditional cultures seemed to agree: they were dubious about the food value of these plants, and mostly grew them as ornaments in the belief that they were unhealthy to eat. Guilt by association and the accumulated wisdom of traditional gardeners makes for a plausible theory, but fortunately there’s just no evidence that nightshades are dangerous in any way for most healthy people. On the other hand, they might be a bad idea for people whose guts and immune systems are already compromised, especially anyone with an autoimmune disease. The best evidence for the health risks of nightshades is connected with arthritis and joint pain, especially the autoimmune disease of rheumatoid arthritis. But even the “best evidence” isn’t that great: it’s mostly based on personal reports and the experience of nutritionists and integrative health specialists. One doctor conducted several surveys, and found that eliminating nightshades was extremely helpful, but that kind of survey has many limitations: there was no control group, and that just asking people “what did you eat?” is an unreliable way of gathering evidence. Even bearing in mind the relative lack of solid evidence in humans, though, it’s still an interesting theory, especially when you look into the proposed causes for this effect: why are nightshades so often blamed for pain, inflammation, and autoimmunity issues? One theory has to do with Vitamin D. There’s a lot of evidence from animals indicating that nightshade vegetables cause all kinds of joint and bone problems, mostly because of the way the animals’ bodies process the form of Vitamin D in the nightshades. Vitamin D is crucial for proper bone formation, but the extremely potent form of Vitamin D3 in nightshade vegetables actually prevents proper calcium metabolism, causing the body to deposit calcium in the soft tissue (where you don’t want it) instead of in the bones (where you do). In animals, this causes very painful arthritis and joint inflammation. On the other hand, though, humans don’t metabolize Vitamin D in the same way as cows and horses. Animal studies just aren’t always relevant to human beings: avocados, for example, are toxic to dogs, but perfectly healthy for people. So the animal evidence is interesting, but doesn’t necessarily prove that humans will suffer in the same way. Other research doesn’t blame the Vitamin D, but attributes the autoimmune dangers of nightshades to various other factors, usually a group of chemical compounds called alkaloids. Alkaloids include solanine (in potatoes, especially green potatoes), nicotine (in very small amounts: nightshade plants are not addictive like cigarettes! ), and capsaicin (the chemical that gives peppers their heat). While the plant is alive, these compounds work as its home-grown “bug spray,” defending it from pests and molds that would otherwise kill it. In other words, they’re designed to be toxic. In the poisonous members of the nightshade family, these chemicals are so concentrated that they have deadly effects on humans, but in the edible nightshades, they’re present in much smaller amounts, and mostly in the leaves and stems (which we don’t eat anyway). Since humans are so much bigger than bugs and mold, and since we’re not eating the most alkaloid-rich parts of the plant, most of us notice absolutely no effect from eating tiny amounts of this natural “bug spray.” It’s like trying to taste a single grain of sand in an enormous bowl of soup. In theory it’s a bad idea to eat sand, but such a tiny amount makes absolutely no measurable difference to your health. Healthy guts can deal with these chemicals just fine, but people whose digestive system is already compromised by an autoimmune disease have trouble with them. For example, some kinds of alkaloids increase the power of the immune response – exactly what you don’t want when you’re dealing with an autoimmune disorder. Another danger of alkaloids is gut irritation: their job in the plant is to kill things, and when they start killing things in your intestine as well, the cells lining the intestinal tract are their first victims. This irritation of the gut contributes to intestinal permeability (“leaky gut”), which can set off an autoimmune reaction when various proteins that should stay inside the digestive tract instead make their way out into the bloodstream, and the body attacks them in response. On top of the alkaloids, there’s also the lectin issue. All foods contain lectins; many of those lectins are completely harmless, but others are gut irritants – the hard part is figuring out which is which. We know that the lectins in peanuts, for example, are dangerous. The lectins in nightshades may also be gut irritants in sensitive individuals, setting off the same leaky gut response as the alkaloids. What’s the evidence for this actually happening? It’s fairly scanty, but suggestive. In this study, for example the researchers fed potato skins (the skin is where most of the alkaloids lurk) to mice with inflammatory bowel disease, and found that gut inflammation was significantly increased. The higher the alkaloid content of the potatoes, the worse the inflammation. In fact, the same chemical compounds that cause so many problems in nightshade-sensitive people can bring benefits to people with healthy digestive systems. Capsaicin, for example, might be more familiar to most of us as an anti-inflammatory, one of the big health benefits of eating hot peppers. That’s because it really does work that way in healthy people. The minor irritation of the capsaicin triggers such a strong anti-inflammatory response that the overall result is anti-inflammatory and beneficial (if this sounds familiar, it’s the exact same way that antioxidants work). Alkaloids have even been studied as therapies for various diseases, precisely because of these benefits. The deadly nightshade, for example, has been used in folk remedies since we realized how strong it was, and it’s now the source of the antispasmodic drug atropine. The powerful poison can also be turned into an equally powerful remedy, if it’s prepared correctly. To sum it up, it’s only for people with gut problems – autoimmune diseases, leaky gut, and related issues – that the minor irritation of alkaloids from edible nightshades is too much to handle. For healthy people, the hormetic stress of alkaloids is neutral at best, and may even be a benefit. Should you avoid nightshades? If you’re trying to heal from an autoimmune disease (especially rheumatoid arthritis or anything else that causes joint pain and inflammation), a 30-day nightshade elimination is definitely worth a shot. After all, it can’t really hurt, and you might be surprised at the benefits. 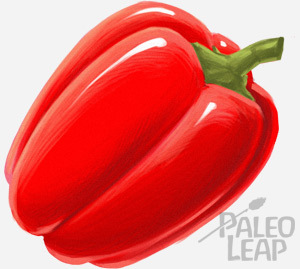 You can find details about the Paleo autoimmune protocol (which restricts nightshades, as well as a few other types of foods) here. Cooking nightshade vegetables whenever you eat them (this reduces alkaloid content further). People without an autoimmune disease or chronic pain issues probably won’t see much benefit from eliminating nightshades. There’s not much harm in experimenting, but there’s no reason to make an already strict Paleo diet even stricter if you don’t have to. Most of us can enjoy tomato sauce, eggplant, and hot peppers just fine, and even see some benefits from those same chemicals. YOU may love a chocolate biscuit with a cup of tea, a handful of lollies after lunch or a sneaky packet of chips with a glass of wine after work. Whatever your choice of snack food is, chances are you know you would be better off without the extra fat, sugars and calories. Yet, in Australia we eat a lot of junk or “discretionary foods”. Now, new research from Benjamin Schuz from the University of Tasmania has looked at why we find it hard to stop eating. Published in the eating behaviour journal Appetite, the study investigated the factors that specifically influenced the eating and drinking habits of 50 adults. Their moods, social behaviour and eating prompts were tracked across a 10 day period. When it came to both eating meals and snacks, the results were clear. When food is available, we will eat it. Forget willpower — the mere presence of food means we are highly likely to eat it. This means if you buy the food, even if it is only for guests or for special occasions, or have a biscuit tin or lolly jar or fundraising chocolate box at work, you are significantly more likely to eat whether you are hungry or not. If you really don’t want to eat it, do not buy it. Keep food out of sight in any environment you spend a lot of time in. Just being in a food court can make you want to eat. It appears that seeing others eat, whether you are hungry or not, immediately gives us permission to eat too. This behaviour is commonly observed at food courts and airports when a significant number of people are eating at any point in time, whether it is a meal time or not. This finding confirms that of the Framingham Heart Study, which in a 30 year analysis found that we basically become like the people we spend our time with. When it comes to overeating and weight gain, this finding suggests that the more those around us eat, the more we will eat and as such the healthier the environments in which we spend our time, the healthier we are likely to be. For most of us this means we need both our homes and our workplaces to be as healthy as possible if we are to control our weight. Although not as powerful as having food available, or seeing others eat, indeed feeling sad, depressed or just down is enough to drive eating behaviour, particularly when it comes to snacking. For those of us who eat to self soothe, keep in mind that this is often learnt behaviour, taught to us as children or via media channels when we are encouraged us to eat certain foods to feel better; or to buy a packet of Tim Tams when we are watching TV alone at home. As such, the only way to control emotional overeating is to identify when we are feeling sad or down and learn to self soothe in other ways, or if you must eat, choose portion controlled treats. Not surprisingly one key factor found to help control food intake was the simple act of keeping busy. Engaging in activities other than eating was a key factor that resulted in both fewer meals and snacks being consumed. This is also likely to somewhat explain why we eat more at night when we are sitting at home, perhaps not overly engaged. It also suggests that keeping busy, without tempting food stimulus is a key factor in managing our food intake on a daily basis. In contrast to the observation that saw study participants eat more when others were eating, in this study being around friends and family actually significantly decreased the consumption of snacks. This finding suggests again that simply being engaged with others appears enough to limit our intake of extra foods and control our eating when we are enjoying meals. For this reason seeking out the company of others when we are due for a snack or a meal appears to be another simple way to help control the amount of food we consume. White striping is becoming more common in chicken – and it’s not a good thing. According to a new video by Compassion in World Farming (CIWF), those stripes indicate a muscle disorder in chickens, which the group links to poor breeding conditions that lead to the birds growing too fast. As a result, the taste and nutritional value of the chicken is affected, with meat that contains more fat and is less tender, reports Buzzfeed. CIWF also points out the suffering the birds endure from putting on weight too rapidly. Researchers say the severity of this “white striping” has increased in recent years, with one study involving 285 birds showing 96 per cent were affected. CIWF says while severely affected meat is generally used for products such as chicken nuggets, moderately affected chicken is sold at supermarkets. However, a spokesman for the US National Chicken Council told Buzzfeed that white striping affects only a “small percentage” of chicken meat and “does not create any health or food safety concerns”.